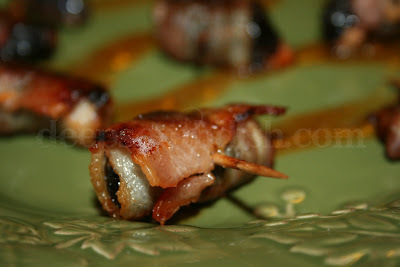 A fall back to the good ole days, Angels and Devils on Horseback are simply bacon wrapped, bite sized yum yums, one based on dates, the other, oysters. Angels on Horseback are similar to their counterpart, Devils on Horseback, except instead of dates wrapped in bacon, we're using oysters, and like their counterparts, the bacon you'll need and how you cut it, is going to be dependent on the size of the oysters, so you may need to cut it into two or three pieces. Here's how to make them. Mix the garlic powder and hot sauce in with the oysters and their juice; let sit for about 20 minutes. When ready to bake, cut the bacon in half and layer between paper towels. Cook in the microwave on high for about one minute, just to partially cook. Wrap a portion of bacon around each oyster, secure with a toothpick and bake at 400 degrees F for about 5 minutes. Check, turn over, and continue baking in 5 minute increments, until done. Can also broil instead. Rumaki: Chicken livers wrapped in bacon, grill or bake. Mock Rumaki: Wrap water chestnuts, and a small chunk of pineapple or pickle if you like, in bacon; grill or bake, then drizzle with a reduction of balsamic vinegar cooked down with brown sugar. Lit'l Smokies stuffed in jalapenos with cream cheese and wrapped in bacon, grill or bake. Boneless chicken breasts, flattened, spread with cream cheese, sprinkled with jalapeno, sliced into bite sized pieces, wrapped in bacon and grilled or baked. Mushrooms - Fill mushrooms with cream cheese; wrap with bacon and bake.